Inspector Morse Series Eight, on 5 dvd's. DELIVERED FREE IN THE UK when you spend over £15. 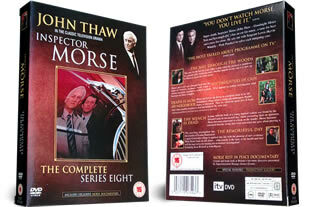 The complete eighth series of the classic television detective drama Inspector Morse on 5 dvd's in this set. Super Sleuth Inspector Morse has an ear for music, a nose for crime and a taste for beer. With the young Sergeant Lewis (star of the new ITV series Lewis) they set out to solve crimes.